It’s my favorite time of year. I love the shiny decorations, the yummy treats, and even the made-for-television Christmas movies. I love the excitement and wonder of the season. As the Christmas decorations went up this year, though, I thought that I’d express my concerns about a very popular Christmas tradition that has emerged: The Elf on the Shelf. Don’t get me wrong. The elf is cute. We even have one. But this is the big difference between the elf at our house and the Elf in the homes of others. This is how the Elf on the Shelf concept works: The elf is not to be touched. Children are told that he watches how good or bad they are and that he reports what he sees to Santa while the children are asleep. Each morning, the elf shows up in a new location (and the photos are splattered on social media) to remind the children that he watched, flew to the North Pole, reported to Santa, and returned for another day of work. This year there are movies about the Elf and he even has clothes (which, of course, are sold separately). The concept is cute. It reminds children to be good throughout the Advent season and evidently creates quite a bit of fun for adults. I have seen photos of the elf on a toilet, in the midst of flour all over a counter top, and surrounded by other such messes that he supposedly made. But this is the problem: the focus turns from the real reason we celebrate Christmas (the birth of Jesus) to an imaginary tale for children (and parents alike). Rarely do I see photos of nativity sets, videos of families reading the story of Jesus’s birth to children, or do I hear children talk about why we celebrate Christmas. The focus has shifted from Jesus to the Elf on the Shelf, Santa Claus, and other fun aspects of Christmas. While fun can be had throughout the season, it is the responsibility of parents to teach their children why we celebrate Christmas. This is difficult to do when so much emphasis has been placed on the Elf and taken off of Jesus. So, what can we do about this? In our home, the elf is a toy, just like any other toy. He can go on adventures (just like Barbies and Transformers can), but he is not magic nor does he travel to the North Pole to report how good or bad our children were. In our home, we are Christians, which means that we believe God does the watching (and not with the intent to “catch us” being bad). God is with us at all times (and doesn’t need anyone to report for Him). In our home, the focus is on Jesus. We often ask our children, “Why do we celebrate Christmas?” and they respond, “Because it’s Jesus’s birthday!” They even correct those in Christmas movies who say that we celebrate Christmas for other reasons. In our home, we read the Christmas stories at the beginning of Matthew and Luke. We talk about the myths that have developed through the years (like 3 wise men, Mary riding a donkey, etc.) and we read the stories to teach our children to let the Bible speak for itself. In our home, we have many nativity sets. As we set them up, we have the children recount the story of Jesus’s birth. Watch this video of our daughter as she sets up the nativity set. : https://www.facebook.com/photo.php?v=674581039228347&set=vb.100000293704343&type=2&theater. We place the nativity sets in prominent places to show that our focus is on Jesus. Let’s take Christmas back. When our son read the title of this article, he laughed. I asked him who he thought would win if there was a contest “Elf on the Shelf VS Jesus in the Manger.” He exclaimed, “Jesus!” This Christmas season, I sure hope that he is right! 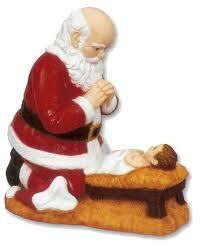 For another great blog related to this topic see http://davidwpendergrass.blogspot.com/2012/12/a-christian-view-of-santa.html.